Whether this is an accurate account or not, it is now evident that all the great civilisations in human history brewed some beverage that bears a relation to beer, including Scottish, Irish, English, Norse, Egyptian, Aztec, Chinese, and virtually every other. This includes a tremendous variety of distinct types of beer, although they all share the basic defining characteristics described above. In some cases, it was shrouded in mystery, tied to religious beliefs and practices—in Sumeria, for example, Ninkasi was the goddess of beer. The Greeks and Romans called beer “cerevisia” (similar to the Spanish “cervesa”, alternatively spelled “cerveza,” still in use), derived from “Ceres”, the Roman goddess of agriculture, and “vis,” Latin for strength. In English speaking societies, brewers in the past have referred to yeast as “God-is-good,”  a reflection of their reverence for the mysterious process that produced their drink, and in Medieval Europe, brewing was largely the domain of monastic orders. On the other hand, brewing was a practical response to the poor quality of accessible water supplies, though the reasons for beer’s relative safety remained a mystery until more recently. Indeed, Arnold, the patron saint of brewing, was known for promoting beer as a relatively safe drink in comparison to unclean water. In addition, archaeologists have proposed that beer was a nourishing beverage that may well have been a significant component of workers’ diets in ancient times as they toiled long hours in the desert heat. While categorized as beer on the basis of the basic characteristics of their production process and ingredients, the beers brewed in ancient times would probably be unrecognizable as beer to the modern consumer. The drink gradually evolved over time to become the beverage so popular today. Modern beer—that is, beer made from malted grain rather than bread, more or less by the techniques that continue to be practised today, according to recipes similar to those used today—was developed in the 1800s, principally in Germany and Austria (lagers and wheat beers) and England and Ireland (ale and stout), but also in other parts of Europe. Its transplantation to North America followed the movement of communities of Germans to the United States and British to Canada. The origins of most of the major breweries in both countries are similar. For example, John Molson was a British immigrant to Canada in the 1700s; Anheuser-Busch and Millers were both started by German immigrants to the United States, while countless others have similar origins. Following the initial expansion of brewing in North America around these immigrantentrepreneurs, the modern brewing industry has coalesced, partly due to competition and its resulting attrition of the less efficient or lower quality producers, partly due to phases in legislation around alcoholic beverage production, such as prohibition in North America, and partly due to technological changes such as mechanical refrigeration. 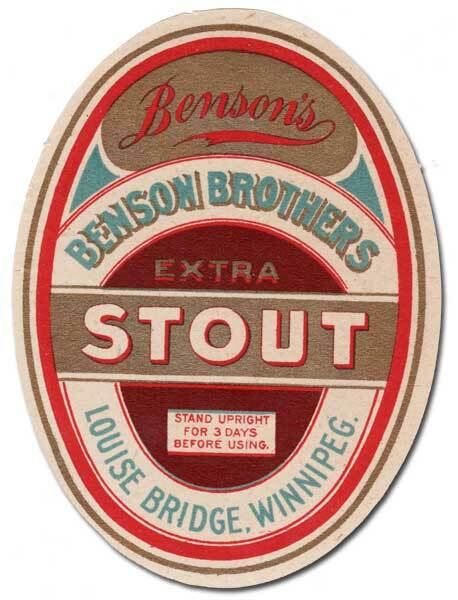 Benson Brothers Brewery operated in Winnipeg for only two years, starting in 1904, before being bought out by Arnold Riedle, who renamed it the Edelweiss Brewery. “Along with back bacon, winter and hockey,” according to writer Stephen Beaumont, “beer practically defines Canada.”  Beer has been brewed in Canada for at least 450 years, and most likely much longer. While the Jesuit Brother Ambroise is usually named as the first brewer in Canada (the Jesuits established a brewery in Sillery, Québec, in 1647),  and Louis Hébert, Canada’s first farmer, is claimed to have brewed beer in 1627 to celebrate a birth,  Canada’s First Nations had already been brewing spruce beer, likely for generations. In fact, Jacques Cartier and his crew could well have died from scurvy had they not been shown how to make this brew when they were staying near Stadacona (now Québec City) upon their arrival in North America, in 1535. Spruce beer, however, bears only the slightest similarity to modern beer. Canada’s first commercial brewery is traced to 1668, when Jean Talon, the Great Intendant of New France, established “La Brasseries due Roy” [sic] in Québec City. It was an ingenious solution to several coincident problems. There was a surplus of grain and a shortage of safe drinking water, and the local economy was struggling because more money was being spent on imported goods like French brandy than was being earned through exports—a classic example of leakage effects in a small open economy. 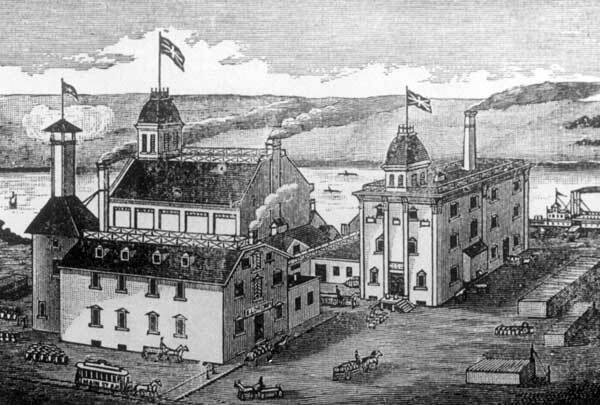 Brewing provided a market for the surplus grain, was a source of safe liquid to drink, and competed with imported liquors to help keep more money within the local economy, thus becoming one of Canada’s first instances of “importsubstitution industrialization.” The brewery proved that the colony could achieve self-sufficiency in certain industries, and was even so successful that it began to export beer to the West Indies. Beer, it appears, was an important early domestic and export industry, if not in volume then at least symbolically, demonstrating the economic potential of the colony. However, for most of the next century, brewing existed primarily as a cottage industry. Certainly many of Canada’s early settlers brewed some form of beer in their homes, and perhaps some of the wealthier Canadians operated their own small brewery,  but the business of brewing remained a very unstable infant industry. As it turns out, Talon’s commercial brewery only lasted a few years, and several others also came and went during the tumultuous first years of the domestic brewing industry. However, what is clear is that Quebec was the geographic epicentre of the development and expansion of the brewing industry in Canada. Stephen Beaumont divides Canada’s brewing history into four eras: Traditional Brewing, Prohibition, the Decline of Distinction, and the Renaissance. The last is marked by the birth of the new microbrewers, and the period preceding it by the consolidation of the national brewers, along with their marketing of increasingly indistinct, and generally bland lagers. 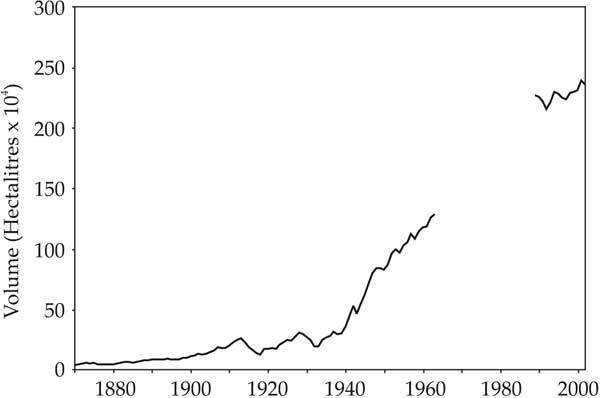 Number of breweries in Canada, 1850-2002. Sources: Brewers Association of Canada, 1965, Brewing in Canada, Montreal: Ronalds-Federated Ltd.; Brewers Association of Canada, various years, Annual Statistical Bulletin; The Western Brewer, 1903 (supplement), One Hundred Years of Brewing: A Complete History of the Progress Made in the Art, Science and Industry of Brewing in the World, Particularly During the Nineteenth Century, New York: H. S. Rich and Co. 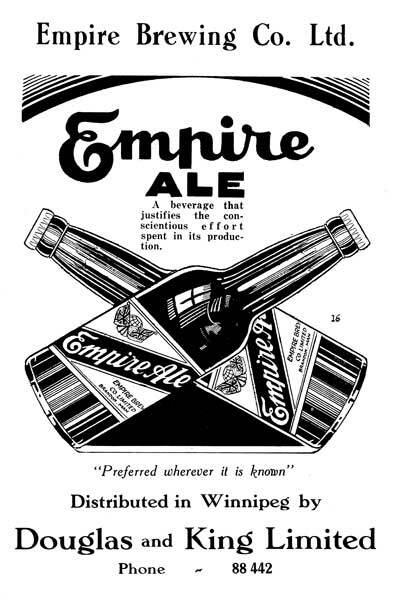 The Empire Brewing Company was founded in 1899 by Brandonite Isaac Alvin Robinson. In addition to brewing several types of beer, it made soft drinks, carbonated water, pickles, cider, vinegar, table sauces, and hotel supplies. It closed in 1931. A few of the larger brewers, and the families behind them, became powerful and influential entities within Canadian business. The Montreal-based Molson family, for example, built a national business empire that has included much more than just beer. They were among the first shareholders in the Bank of Montreal upon its founding in 1817, with John Molson Sr., founder of the brewery, later serving as president of the Bank for four years. Three decades on, the family left the Bank of Montreal and started the Molson Bank, which operated for about seventy-five years, closing and merging with the Bank of Montreal in 1925. At its height, the Molson Bank operated branches across Québec, Ontario, and Western Canada. The Molsons also had interests in lumber, steamships (building and service), public health (Montreal’s first public hospital), theatre, hotels, and Canada’s first railroad. Other major brewing families made similarly diverse contributions to Canada’s economy and culture. For example, the Bluenose II, the replica of Canada’s legendary sailing ship of the 1920s and ‘30s, was commissioned by Halifax brewers Oland and Son, the event being commemorated by their new brew, “Schooner.” George Sleeman managed and financed Canada’s first world champion baseball team, the Maple Leaf Baseball club, in 1874. There are endless such stories of how Canadian brewers have been central to Canada’s cultural symbols and achievements. 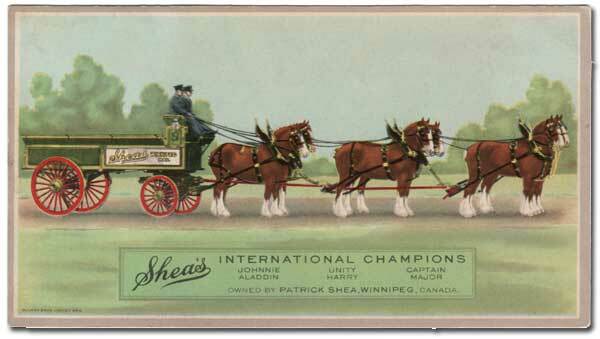 The award-winning Clydesdales of Shea’s Brewery, featured at prairie fairs as well as on postcards like this 1928 example, were the model for American imitators. Prohibition swept across Canada during World War I, although each province implemented it at different times and for different durations. 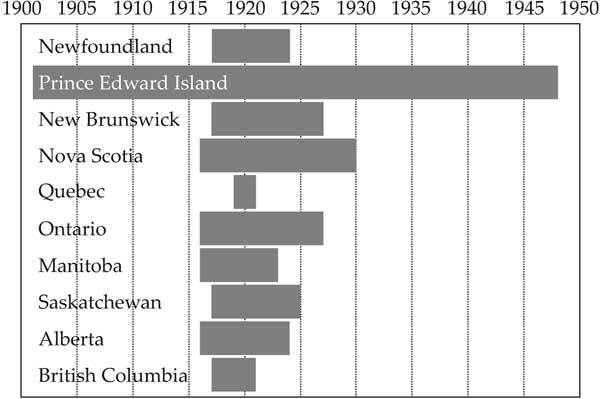 The provincial variation was not the only complication associated with Prohibition in Canada; there were also implications arising from the different capacities of the federal versus provincial governments to regulate aspects of alcohol production and consumption. Specifically, production of alcoholic beverages was federally regulated, while sale and consumption were provincial jurisdiction. Because the two jurisdictions didn’t act in step with one another on the issue of alcohol, a loophole in Canada’s Prohibition laws provided interesting opportunities to brewers as production and export, for most of this period, were not prohibited. The major exception to the general Prohibition was in Quebec, where light beer remained legal (along with wine), and only spirits were prohibited—suggesting in that province that the “lighter” alcoholic beverages enjoyed a different social status. PEI: home of Canadian sobriety. This chart shows the dates when Prohibition began and ended in each province. Source: Brewers Association of Canada, 1965, Brewing in Canada, Montreal: Ronalds-Federated Limited. There remained a few exceptions to the general Prohibition as alcohol was allowed for industrial, scientific, religious, and medicinal purposes. Therefore, one particularly creative response to the ban was for a consumer to have alcohol prescribed as medication. This practice seems to have proliferated in some places. For example, one Ontario doctor is alleged to have issued 487 prescriptions for ale in one day. One doctor issued as many as 1,244 prescriptions for liquor in one month (before a limit of 50 was put in place in 1921). So as not to lose out on this lucrative trade, veterinarians in Saskatchewan fought for and won licenses to prescribe alcohol to their “patients.” These latter courses of action represented ways of selling what the law did not prohibit brewers from producing. 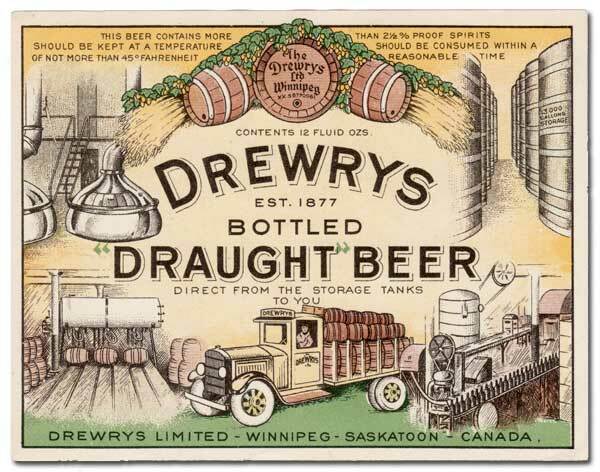 “Direct from the storage tanks to you.” This 1920s bottle label featured the Drewry Brewery equipment and facilities. The American trade was most important. It has been estimated that 80% of Canadian beer went south during the first five years of U.S. Prohibition—leading contemporary commentators to label this trade as “humanitarian” —and the Americans seemed to appreciate their neighbours. As noted, Canada’s own Prohibition laws were sufficiently loose to allow this; what was not allowed was the sale of alcoholic beverages within the provinces to local consumers. In fact, Ontario Magistrate S. Masson once defended the practice of selling to the U.S., stating that “there is no burden cast upon us to enforce the laws of the United States.”  As a result, the brewing of “strong beer” for export was perfectly legal, even though the vast majority of it went to the U.S., where its purchase was not legal. Some breweries, like the British American Brewing Company of Windsor, located on the Detroit River, were well positioned for the American export trade. The Bermuda Export Company, operating during the 1920s, was managed by C. F. Clapp of this brewery, out of three docks, all within close proximity of the brewery. 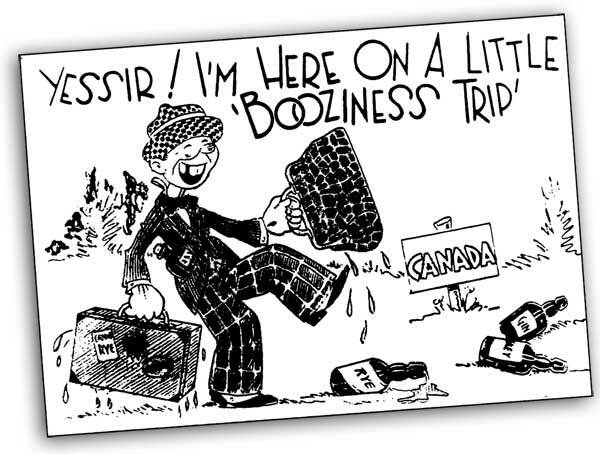 Although Canada eventually bowed to pressure from the United States and made export of alcohol to that market illegal in 1930, there were again creative ways around the law. The bootleggers claimed on their customs forms that the beer they were “exporting” was bound for Cuba, Mexico, or other such places, but the boats would return from Detroit within an hour of departing, to ship another load, and the officials remained quiet—as a result, the boats were known (tongue in cheek) as the fastest boats on water. For example, the Cuba-Mexico Export Company operated out of Windsor with just one small motor boat, making as many as four trips in a day. It seems that so long as the taxes were paid (which they usually were), the officials asked no questions, provided the beer did not end up back in Canada. Bribes probably eased the trade too. In addition, some of the exports were certainly overtly illegal—booze was simply smuggled across the border under no pretence of “export” to a legitimate destination. This “rum running” was often dangerous, and although better known for whiskey, included beer as well. While not all Canadian breweries were able to take advantage of the American trade, those which did saw practically unlimited potential. According to a Canadian official: “The only limit to the amazing amount of liquor which may be legally shipped from Canada to the United States is the capacity of breweries and distilleries.”  Although whiskey was the higher value commodity, beer was still a popular export too, and in some places more important than spirits. In the bootleg trade between northern New York and Canada, beer made up 75% of the traffic, partly because whiskey was available to the state from other offshore sources. An additional trade was earned by serving American customers who came to Canada to buy beer and other alcohol, legally, once the provincial Prohibitions had ended. For example, when Ontario repealed its Prohibition, “thousands of Michigan residents poured into Windsor, Sarnia, Sault Ste. Marie, and other Ontario cities and ports to purchase beer, wine, and whiskey.”  By the time American Prohibition was repealed in 1933, Canadian breweries had made small fortunes on exports to the United States. Source: P. P. Mason, Rum-Running and the Roaring Twenties: Prohibition on the Michigan-Ontario Waterway, Detroit: Wayne State University Press, p. 48, 1995. While some breweries survived these lean years, many did not. Those located further from the American border seemed least able to cope. 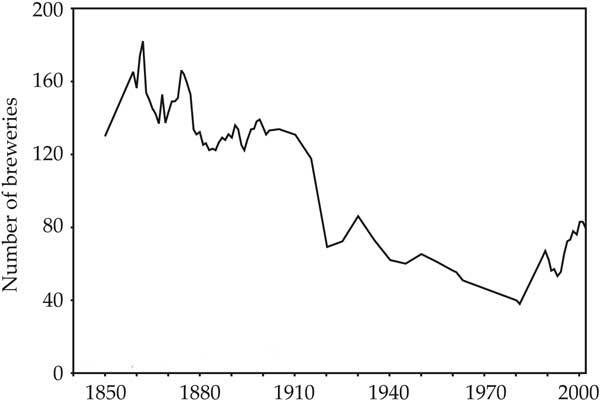 Overall, from 1915 to 1920, the number of breweries in Canada declined by 42%, from 118 to 69. And several more closed up not long after that. The depression of the 1930s, followed by World War II, also had an adverse effect on the brewing industry. Like most sectors of the economy not directly related to the war effort, brewing saw a decline in the money people were willing to spend on their products during these tight times, and a significant reduction in the number of potential customers once the soldiers were sent overseas. During this time, the sale of beer was limited through the issue of ration coupons. And in December 1942, Canada issued the Wartime Alcoholic Beverages Order, limiting the importation and sale of alcoholic beverages to a set proportion of the level achieved for the year ending 31 October 1942. For beer, the proportion was 90%. Also, the order prohibited the advertising of alcoholic beverages. 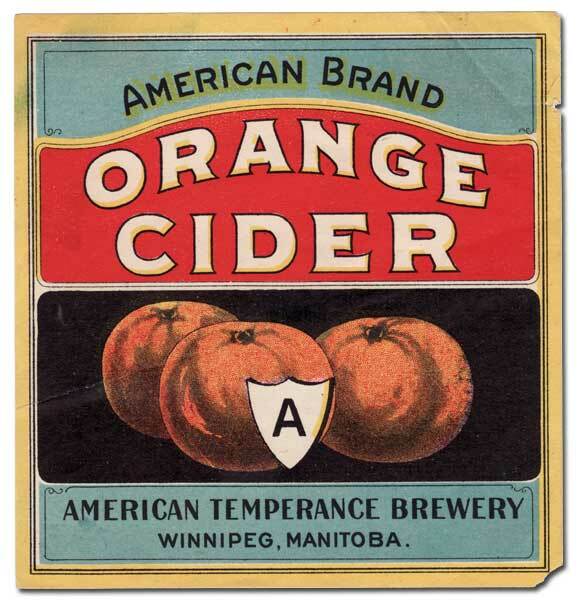 Fruit ciders were alternatives to beer during Manitoba’s short experiment with Prohibition. As is often the case with small brewers, the American Temperance Brewery, located at 358 Flora Street in Winnipeg, survived only a few years. Changes in the marketing of beer and technologies of beer production, along with the shakeout that resulted from Prohibition, the Depression and World War II, resulted in a tremendous consolidation of Canada’s brewing industry in the hands of a few companies. The volume of beer produced in Canada from the 1870s grew steadily, even dramatically, apart from the stutters associated with the events above. Meanwhile, the number of breweries operating in Canada declined from the early 1900s (especially during the Prohibition era) until the 1990s. Even more telling, these data conceal the concentration of ownership that arose. While in the early days, all breweries would have been independently owned and operated plants, a wave of mergers and acquisitions ensued as the bigger brewers gradually took some of these over (while others simply disappeared), with this process accelerating after World War II. Already in 1945, the sixty-one breweries operating in Canada were owned by thirty companies. By 1963, there were still fifty-two breweries, now owned by only ten companies, and the majority by the “big three,” Molson, Labatt, and Carling-O’Keefe. The variety of beer available to local consumers also declined during this period, and some would argue that the quality followed the same trend. The big three sought to market more generic types of beer to a wider, national audience, sacrificing selection for standardisation at the lowest common denominator. Ales and porters, formerly the more popular styles, virtually disappeared. The market was dominated by increasingly indistinct lagers, which were already dominant by the 1880s, no longer marketed for their taste, but by the image the brewers tried to cultivate for their brands. Beer production in Canada, 1870-2002. Sources: Brewers Association of Canada, 1965, Brewing in Canada, Montreal: Ronalds-Federated Ltd.; Brewers Association of Canada, various years, Annual Statistical Bulletin. The most notable example of the consolidation of brewing during this period is demonstrated by the activity of E. P. Taylor, who entered the brewing industry as a director of Brading Breweries Ltd., originally established in Ottawa in 1865 as Union Brewery by Israel, Brading, and Attwood. Starting with the merger of Brading’s with Capital Brewing, also of Ottawa, then with Kuntz Brewery of Waterloo in 1930, Taylor built the empire that eventually took the name of Carling-O’Keefe (two of the breweries swallowed up during the expansion). In the 1930s and 1940s Taylor bought approximately thirty breweries, reducing one hundred and fifty brands to eight, establishing the Brewing Corporation of Ontario (1930), later renamed the Brewing Corporation of Canada, which became Canadian Breweries Limited (1937), and renamed Carling-O’Keefe in 1973 after being purchased from Taylor by Rothman’s in 1968.  Notable takeovers included National Breweries Ltd. of Quebec, itself a collection of formerly independent breweries such as Dow and Dawes. The expansion of E. P. Taylor’s holdings was particularly aggressive, with many of the purchased breweries simply being shut as a means of stifling competition. For example, in the 1930s, the Brewing Corporation of Ontario bought both the British American Brewing Company and the Riverside Brewing Corporation, both of Windsor and local competitors. The latter was almost immediately closed, and its business was shifted to the former. Sometimes the closure was not immediate, but more often than not, it came sooner or later. For example, Canadian Breweries took over the Walkerville Brewing Company in 1944, initially promising to continue to operate it as is. Within a year, it was converted to Carling Breweries Limited (Walkerville), but then taken over by another of the Canadian Breweries subsidiaries, O’Keefe’s, in 1947. Finally, it was closed altogether in 1956. The company’s strategy was ruled to be “predatory” by a federal competition investigation in the 1950s, but the commission’s report also suggested that the growth and expansion of Labatt and Molson had ensured the continued existence of a competitive national beer market so no action was necessary. Sault Ste. Marie’s Northern Breweries Ltd. also grew during this period by absorbing other breweries, eventually to be taken over by Canadian Breweries in 1971, but it was sold back to the employees by Carling- O’Keefe in 1977. Molson and Labatt expanded in a similar way to Carling-O’Keefe, with this period culminating in the purchase of Taylor’s empire by Molson and Foster’s (Australia) in 1989 (with the two splitting ownership), thus reducing the “big three” in Canada to the “big two” national brewers. Molson and Labatt increasingly downplayed distinctive local beers and focussed on the marketing of more generic beers to the national market, emphasizing image rather than taste. They had realized, according to Paul Brent, that “the [Canadian] beer business is much more about marketing than it is about brewing.”  The decline of distinction had reached its peak. It is worth noting that through this period, Canadian brewing companies began to make inroads in the American market as well. Again, Carling provides the best demonstration. Carling first entered the U.S. market before World War II, but through the 1950s and 1960s this move became significant with a combination of purchases and new breweries in a number of major and not-so-major American markets (Cleveland, Belleville, St. Louis, Natick, Atlanta, Tacoma, Baltimore, Fort Worth, Phoenix). By 1960, Carling had become the fourth largest brewing company in the U.S., but thereafter, the company’s fortunes entered a period of steady decline. In 1979, Carling left the U.S. market. 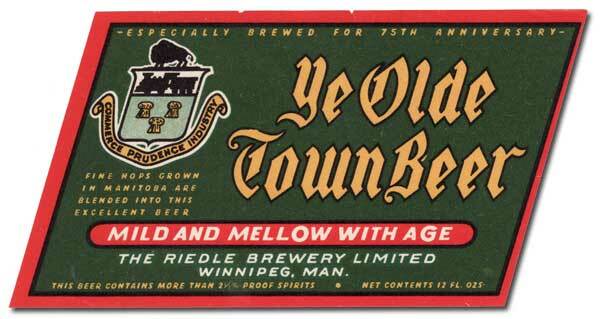 “Mild and mellow with age.” This beer was specially brewed in commemoration of Winnipeg’s 75th anniversary year in 1949. Its maker, Riedle Brewery, was the renamed Edelweiss Brewery, ransacked in 1919 by returned veterans of the First World War. 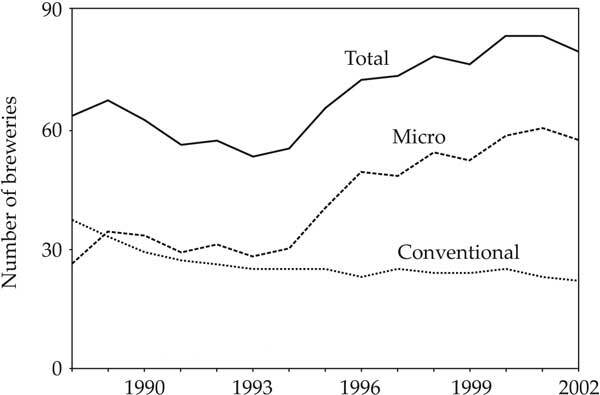 By the 1980s, there were fewer than forty breweries left in Canada, still owned mostly by one of the big three/ two. The consolidation of Canada’s brewing industry was nearly complete, and small scale brewing seemed to be a thing of the past. Due to inter-provincial trade regulations that persisted until the 1990s, most beer was produced in the province in which it was sold. This partly explains why the big three operated separate breweries in virtually every province, rather than centralizing their operations in a few more efficient, larger scale breweries as the American brewing industry had done. On the other hand, the big three expanded across Canada by buying up local brewers and continuing to operate them to serve the local market. As a means of maintaining customer loyalty to existing brands, the big three often continued to brew locally known beers in addition to their own national brands after their takeovers. For this reason, Labatt continues to produce Club (formerly a Shea’s brand) and Molson continues to produce Standard (formerly Drewrys) in Manitoba, beers formerly available only from the original Manitoba brewers. Dozens of examples like this still exist today. Also due to this quirk of inter-provincial trade, brands like Moosehead, while available in virtually every state in the U.S., as well as in England and Australia, were until relatively recently little known in Canada outside the Maritimes. The rapid expansion of the Canadian brewing industry in the 1990s, as measured by the number of breweries, is largely accounted for by the emergence of a new kind of brewer—the microbrewery. In fact, the microbrewery has much in common with the original brewers—small scale and selling, at least initially, to a local market. As Stephen Beaumont puts it, modern microbreweries “hark back to a time when brewing companies were local businesses producing beer for local people.”  There are often more concrete linkages between the traditional brewers and the modern microbreweries as well. Many of the latter are reincarnations of Canada’s traditional breweries that had disappeared during either Prohibition or the wave of consolidation led by the national brewing corporations. The modern microbrewery, Fort Garry Brewing Company of Winnipeg, for example, was reopened in 1994 after the original Fort Garry Brewery, also of Winnipeg, was bought by Molson in the 1960s and subsequently closed. In this instance there was continuity in family involvement as well, as the Hoeschen family were principals in both the original and the new Fort Garry. The data on the recent expansion of Canada’s brewing industry is even more pronounced if brewpubs are included. For instance, in 1996, while there were seventy-two breweries—and notably the microbrewers outnumber the conventional brewers by two to one—the number jumps to one hundred and fifty-five if brewpubs are included. The microbrewing renaissance can be traced to the efforts of a group of beer enthusiasts lobbying provincial governments to “re-legalise” small-scale beer production, or more specifically, to allow new licenses to be issued for new breweries. The movement grew out of the variety of organizations that emerged around the world to promote the production of better quality beer, as compared to the perceived blandness of the mass-produced beers now dominant in most markets. A number of regional and national associations now exist to promote quality and diversity in beer production as well as education in its consumption: CAMRA (Campaign for Real Ale) in England; PINT (Association for Promotion and Information on Traditional Beer) in the Netherlands; OBP (Society of Objective Beer Tasters) in Belgium; DBE (Danish Beer Enthusiasts) in Denmark. These joined to become the EBCU (European Beer Consumers Union) in 1990. The EBCU now has at least 70,000 members across a dozen countries. These organizations have been instrumental in leading the consumer-driven craft beer revolution, which has required the repeal of laws in many jurisdictions preventing small scale brewing or the establishment of new competitors in the well-established, oligopolistic brewing industry. The total number of breweries in Canada has increased since the early 1990s, largely as a result of the emergence of microbreweries. Sources: Brewers Association of Canada, various years, Annual Statistical Bulletin. CAMRA, in particular, was important in Canada. The organization set up a Canadian chapter in 1981, and this group was successful in lobbying the various provincial governments, with the first license for a new brewery being issued in British Columbia in 1982. Early B.C. brewers include Horseshoe Bay Brewing Company (which produced draft for the related Troller Pub ) and Granville Island Brewing. Soon after, microbreweries were sprouting up across the country, followed shortly by brewpubs, again led by B.C. with pubs like Prairie Inn Neighbourhood Pub and Cottage Brewery (1983), and Spinnaker’s, both of Victoria. By the 1990s, the brewing renaissance was well underway. Oddly, throughout this period the lack of new entrants in some markets had not been due to regulatory impediments, but simply to the failure of entrepreneurs to recognise the opportunity that may or may not have proved successful. For example, Ontario had never formally ended the issue of new brewery licences, but until Jim Brickman opened that province’s first new brewery (Brick Brewing Company in Waterloo) in 1984, there simply hadn’t been a new brewer interested in trying. We will never know if the market would have been ready for the new producers any earlier, but unquestionably since the mid-1980s, the Ontario market, as well as others, have proven that the new microbreweries’ time had come. These new microbreweries often operate at least partly anonymously. In addition to marketing their own local, niche brands, many of them engage in “co-manufacturing”—brewing beer (and sometimes other related alcoholic beverages, such as “coolers,” and vodka-based drinks like “hard lemonades,” etc.) for other companies, such as supermarkets or large multinational beverage companies. This contract brewing can be a significant proportion of a brewery’s operation. Ontario’s Lakeport Beverage Corporation of Hamilton, for example, started brewing beers for the local market in 1992, and soon added a number of contract brands such as President’s Choice, Dave Nichol’s Personal Selection, and Pabst Blue Ribbon. In recent years, Lakeport maked and sold more beer for other companies than they did under their own name. Many other brewers engage in co-manufacturing partnerships too, including B.C.’s Pacific Western Brewing Company and Saskatchewan’s Great Western Brewing Company Ltd. The conventional brewers have responded to the increasing popularity of the microbrewers in two ways. First, they have developed and marketed their own new “premium” brands (a return to “distinction”), and in some cases have even pioneered styles to further differentiate their brands from the new competitors. For example, Labatt introduced “Dry” beer in 1989, a bottled “Draft” beer in 1992, and “Ice” beer in 1993—the latter involved the creation of an entirely new brewing process. Second, they have purchased and heavily promoted their own “micro” brands. In some cases, these consist of brands that were already being operated as regional breweries, but more recently have been taken national. For example, Labatt purchased Oland and Sons Ltd. (Halifax, N.S.) in 1971 and Columbia Brewery (Creston, B.C.) in 1974. After continuing to supply these brands to their local markets for two decades, the Alexander Keith’s and Kokanee brands (respectively) are now sold nationally with little indication to the consumer that the products are Labatt beers. Likewise, Molson introduced Rickard’s Red in the early 1980s and initially labelled it as coming from the Capilano Brewing Company, though the beer is really made at Molson’s brewery in Vancouver, no different from any other. The brewery did, in fact, start as a Molson takeover from the “Consolidation” era, known for a time as Molson’s Capilano Brewery Ltd (formerly Sick’s Capilano Brewery). Now, Rickard’s Red is brewed at three Molson plants across Canada (Vancouver, Toronto, and Montreal), so the pseudomicro brand can more easily be distributed to the national market. Rickard’s Red has since been supplemented by Rickard’s Pale and Rickard’s Honey Brown. The styles “red”, “pale”, and “honey brown” are usually associated with premium microbrewery brands, and not traditionally with the national mass-market beers. In addition to their economic value in terms of output, the revival of the smaller microbreweries is driving some other opportunities as well. They are often associated with historic places, and have in many cases been playing a vital role in the preservation and promotion of local heritage, a phenomenon described as “neo-localism”, first by the geographer Yi-Fu Tuan, and since linked to microbrewing in the United States. Creemore, Ontario, for example, has seen a major renaissance of its historic buildings, and a thriving tourism industry to support it, initiated by the establishment of Creemore Springs Brewery in 1987 in a renovated heritage building. In that case, not only did the town’s economy grow around the brewery and the spin-offs associated with the traffic it generated, but the brewery itself actively supported this growth, and the heritage connection. For example, when the owners of a pharmacy wanted to renovate an old building for their business, Creemore Springs provided drawings for the façade, at no charge. The “Main Street Revival” that so many small towns and cities seek was closely tied to the growth of the new microbrewery. Numerous breweries elsewhere have followed a similar route, locating in older premises with historic value, with some even tracing back to earlier incarnations of brewing businesses. Edward L. Drewry’s “Ale and Lager Beer Brewery” on Main Street in Winnipeg, by the present Redwood Bridge, circa 1884. Source: Archives of Manitoba, Winnipeg - Buildings - Business - Drewry’s Brewery 2, N16512. From humble beginnings in the first commercial brewery, established to prove Canada could be selfsufficient, brewing has evolved into a mature industry not only important to the domestic economy, but with a reputation worldwide. Canadian barley is sought after the world over as some of the best available anywhere, thanks to research promoted by the Canadian brewing industry through its Brewing and Malting Research Institute. Canada is one of the world’s largest beer exporters, taking seventh place, even though ranking only sixteenth in total beer production; and Canadian beers take seven of the top twenty spots in the market for imported beer in the United States, with other significant markets including Japan, the United Kingdom, and Hong Kong. The popularity is well earned—Canadian beers are award-winning beers. In the World Beer Cup (the premiere world beer competition) held every two years, Canadian brewers consistently win awards in a variety of categories. In the most recent competition (2004), Canadians were again well represented. Awards included gold (Labatt Blue Light) in the category of “American-Style Light Lager” (perhaps a dubious honour); gold (Bowes Original Lager, Starbrew Inc., Saskatoon) and silver (Brewhouse Pilsener, Great Western Brewing Company, Saskatoon) in “American-Style Lager,” and bronze (Moosehead Lager) in “American-Style Premium Lager.” Notably, ten of the thirteen awards were earned by microbreweries. The Canadian brewing industry continues to evolve. Even the contrast between national, mass-market brewers and microbreweries is less clear than it was in the 1980s and ‘90s. Some of the larger microbreweries, for example, have now begun to expand through corporate consolidation. Sleeman, for instance, now owns the Maritime Brewing Company of Halifax (now Sleeman Maritime Brewery), Unibroue of Quebec, Shaftebury Brewing Company and Okanagan Spring Brewery, both of British Columbia, and Upper Canada Brewing Company of Ontario. Fortunately for fans of local microbrewery beers, Sleeman continues to operate these as distinct brands, mostly brewed at their original breweries as independent operations. In similar fashion, Fort Garry Brewing Company and Two Rivers Brewing Company, both of Winnipeg, merged in 2003. The amalgamated operation is still called Fort Garry Brewing Company, but Two Rivers beers continue to be produced under their original name. A new wave of national consolidation similar to that of the 1940s and ‘50s has yet to occur. The long history of Canadian brewing tells the story of an industry which has grown from modest roots, through an era dominated by scale economies of the large producers, to a phase marked by variety both in product and scale. Having established itself as a major domestic industry, it is now an important player globally, and in turn parallels the broader economic and industrial history of Canada as a whole. Subsequent chapters in this story remain to be told. 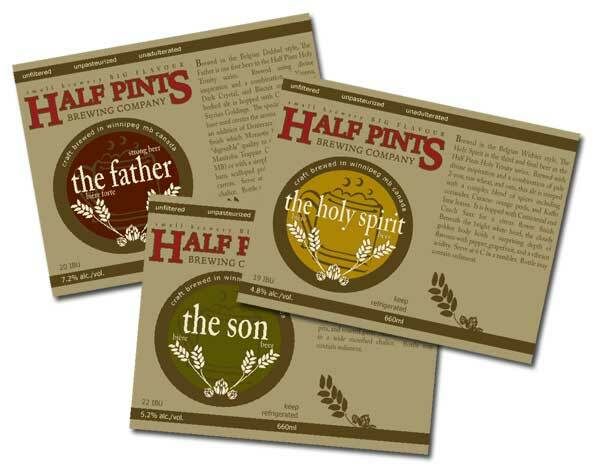 New microbrews, such as this whimsical “Trinity Series” from Winnipeg’s Half Pints Brewing Company, are leading innovation in Canada’s brewing industry. 1. Sherk, Larry, Canadian brewerianist, quoted in Brewers Association of Canada, “Collecting Canada: Beer Memorabilia Reflects National Psyche,” Way Beyond Beer, 2001, vol. 3, p. 4. 2. Leventhal, Josh, Beer Lover’s Companion: A Guide to Producing, Brewing, Tasting, Rating, and Drinking Around the World. New York: Black Dog and Leventhal Publishers, 1999. 3. Brewers Association of Canada, “A Tale as Old as Time,” Way Beyond Beer, 2001, vol. 3, p. 2. 5. Leventhal, Beer Lover’s Companion; Smith, Gregg, Beer: A History of Suds and Civilization from Mesopotamia to Microbreweries. New York: Avon Books, 1995; Trayner, Kevin, The Beer Drinker’s Handbook. London: Prospero Books, 2002. 6. We might also admit, however, that the story usually speculates that the ‘discovery’ of beer was accidental—perhaps the grain was dampened by rain while stored uncovered outdoors, but rather than let it go to waste, the owners tried to salvage what they could, thereby encountering the taste of the mash, fermented by naturally occurring, airborne (and invisible) yeasts. This presupposes, however, that the grain was already being harvested and stored for human consumption before beer itself was known. 7. Leventhal, Beer Lover’s Companion. 8. The Western Brewer, One Hundred Years of Brewing: A Complete History of the Progress Made in the Art, Science and Industry of Brewing in the World, Particularly During the Nineteenth Century. New York: H. S. Rich and Co., 1903 supplement; Smith, Beer. 9. Protz, Roger, “On the Trail of Ale.” All About Beer, 1995, November. 10. Kloss, The Art and Science of Brewing; Trayner, The Beer Drinker’s Handbook; Smith, Beer. The nutritional value of beer is also suggested by the claim that it was beer that carried the monks through their 40 day Lenten fasts (Cook, Charles D., “Heaven on Earth: Belgium’s Trappist Brewing Abbeys,” All About Beer, May 2004, pp. 22-25, 65-67. 11. Smith, Beer, Leventhal, Beer Lover’s Companion. 12. Trayner, The Beer Drinker’s Handbook. 13. Brewers Association of Canada, “A Tale as Old as Time”, 2001. 14. Beaumont, Stephen, Stephen Beaumont’s Great Canadian Beer Guide. Toronto: Macmillan, 1994. 15. Brewers Association of Canada, “Canadians and Beer: An Old Love Affair.” Way Beyond Beer, 1999, vol. 1, p. 2; Trayner, The Beer Drinker’s Handbook. 16. Brewers Association of Canada, “The Story of Beer is the Story of Canada.” Way Beyond Beer, 2000, vol. 2, p. 4. 17. Trayner, The Beer Drinker’s Handbook. 18. Brewers Association of Canada, “Canada’s First Commercial Brewery: Jean Talon and the Dream of Canada.” Way Beyond Beer, 2000, vol. 2, p. 4; The Western Brewer, One Hundred Years of Brewing. 19. Father Francis LeMercier of Quebec wrote in support of the proposal: “A brewery which M. Talon is having built will also contribute not only to the public welfare by forcing a decrease in the use of intoxicating drinks, which occasions a great lawlessness here; that can be obviated by using this other drink, which is very wholesome and not injurious. Moreover it will keep in the country the money which is now being sent out of it in purchase of so much liquor in France. It will also promote the consumption of the super-abundance of grain which has sometimes been so great that the labourers can not find a market for it” (quoted in Brewers Association of Canada, Brewing in Canada, p. xii). 20. Heron, Craig, Booze: A Distilled History. Toronto: Between the Lines Press, 2003. 21. Beaumont, Stephen Beaumont’s Great Canadian Beer Guide. 23. Heron, Booze, p. 25. 24. Phillips, Glen C., On Tap: The Odyssey of Beer and Brewing in Victorian London-Middlesex. Sarnia: Cheshire Cat Press, 2000. 28. Lager was first brewed in North America by George Rebscher, who produced it for his tavern in Kitchener (then called Berlin) in 1837 (Phillips, On Tap). 29. Carter, Tom, “Winnipeg: Heartbeat of the Province.” In J. Welsted, J. Everitt, and C. Stadel, eds. The Geography of Manitoba: Its Land and its People. Winnipeg: The University of Manitoba Press, 1996, pp. 136-151. 31. Gray, James H., Booze: The Impact of Whisky on the Prairie West. Toronto: Macmillan, 1972. In fact, when Gray’s book was republished by Fifth House in 1996, its subtitle was changed to: When Whisky Ruled the West. 32. Quoted in The Western Brewer, One Hundred Years of Brewing, p. 635. 34. Douglas, William, The House of Shea: The Story of a Pioneer Industry. Winnipeg: Bulman Bros. Ltd., 1947, p. 7. 35. Consumption of spirits and wine also grew, but at nowhere near a comparable rate. See Bracken, John (Chairman) et al., Report of the Manitoba Liquor Enquiry Commission. Winnipeg: The Commission, 1955. 38. Temperance/Prohibition were initially aimed principally at the spiritous liquors, but eventually came to include beer as well, since many of the social ills for which liquor was to blame were also linked to the drinking places—taverns and saloons in which beer, along with the harder drinks, was consumed in large quantities. 39. Hunter, Douglas, Molson: The Birth of a Business Empire. Toronto: Penguin/Viking, 2001. 40. Brewers Association of Canada, “The Bluenose: The beer story behind the Legend,” Way Beyond Beer, 1999, vol. 1, p. 3. 41. Douglas, The House of Shea. 42. Temperance movements had been gaining wider acceptance early in the 20th century, following a series of social-cultural changes from the 1850s onward. Initially considered less disreputable because of its lower alcohol content in comparison to the spiritous liquors, beer, or at least its excessive consumption, was counted among the many indulgences from which Canadians would be encouraged to refrain as part of the general austerity promoted to support the war effort from 1914 to 1918. 43. Brewers Association of Canada, Brewing in Canada. 44. Northern Breweries web site, www.northern-breweries.com/soohistory.html, viewed 11 May 2004. 45. Bowering, Ian, “Hic! Hic! Hooray! for Canada: Prohibition and How Canada Kept America Wet,” All About Beer, 2002, May, pp. 22-25, 66. 48. This was not an entirely new phenomenon. In the records that support brewing in ancient times, the Ebers Papyrus is notable as a reference book for Egyptian physicians that includes over 100 “prescriptions” that use beer (Smith, Beer). 49. Gervais, C. H., The Rumrunners: A Prohibition Scrapbook. Thornhill: Firefly Books, 1980. 50. Harry Hatch quoted in Bowering, “Hic! Hic! Hooray! for Canada,” p. 24. 51. Masson quoted in Bowering, “Hic! Hic! Hooray! for Canada,” p. 23. 52. Marentette, William, “Brewed in Windsor: The British American Brewery: 1882-1969.” The Times (Walkerville), 2004, no. 42 (March), pp. 10-16. 55. Ibid. provides an excellent description of the smuggling activities of this era. 56. Quoted in Everest, Allan S., Rum Across the Border: The Prohibition Era in Northern New York. Syracuse: Syracuse University Press, 1978, p. 13. 58. Philip P. Mason, Rum-Running and the Roaring Twenties: Prohibition on the Michigan-Ontario Waterway. Detroit: Wayne State University Press, 1995, p. 146. 59. Gray, James, in Bacchanalia Revisited: Western Canada’s Boozy Skid to Social Disaster. Saskatoon: Western Producer Prairie Books, 1982, claims that, in the Prairies anyway, there is little evidence that returning soldiers were responsible for the pressure for change. Rather, he suggests that the Prairie Provinces’ governments were lured by the promise of windfall tax revenues if Prohibition were replaced by government monopoly on the liquor trade, as had been demonstrated in B.C. in 1921, the first year after Prohibition was repealed there. Accounts of the Prohibition era elsewhere, however, seem to indicate that soldiers were quite active in agitating for its repeal, particularly in the U.S. (Miller, Carl H. “We Want Beer! Prohibition and the Will to Imbibe, part 1,” All About Beer, 2000, November). 60. It is worth noting that in many cases the end of Prohibition occurred in phases. Most commonly, the lighter alcoholic beverages were reintroduced first. In Ontario, even beer was not simply relegalized. Initially, in 1925, only beer containing a maximum of 4.4% alcohol was allowed - under Premier Ferguson, such beer was dubbed “Fergie’s Foam”. Only later, in 1927, was the 4.4% limit lifted. See Gervais, The Rumrunners. 61. Bowering, “Hic! Hic! Hooray! for Canada;” Gervais, The Rumrunners. 62. In Manitoba, the town of Steinbach voted to go wet only in 2003, after several previous referenda had failed to overturn the ban on alcohol (Helen Fallding, “After 30 years, Steinbach chooses booze,” Winnipeg Free Press, 23 October 2003, pp. A1, A4. 63. Brewers Association of Canada, Brewing in Canada. 65. Beaumont, Stephen Beaumont’s Great Canadian Beer Guide. 67. Marentette, William, “Once Upon a Brewery,” The Times (Walkerville), 2000, November, no. 11, pp. 16-19. 68. Paul Brent, Lager Heads: Labatt and Molson Face Off for Canada’s Beer Money. Toronto: HarperCollins, 2004. 69. Northern Breweries web site. Northern Breweries was employee-owned from 1977 to 2004, when it was bought by an investment group. 70. By this time, Carling O’Keefe was struggling. During its early expansion, it quickly became Canada’s biggest brewing company, because Labatt and Molson did not expand beyond their home regions until later. However, the latter companies had the foresight to create and market national brands, while Carling-O’Keefe continued to operate as a series of regional breweries with lesser emphasis on the creation of purely national brands. This became a competitive disadvantage (Brent, Lager Heads). 72. Yenne, Bill, Beers of North America. London: Bison Books, 1986. 74. The Brewers Association of Canada once defined a microbrewery as “a brewer which markets its products mainly from its plant and has an annual production volume of less than 60,000 hectolitres.” (Brewers Association of Canada, Annual Statistical Bulletin 2000. Ottawa: B.A.C., 2001, p. 2). The size threshold has since been abandoned and the category less strictly defined, although it is still conventionally understood in terms of small scale and local or regional market orientation, as well as production methods (usually no preservatives or adjuncts, for example). 75. Beaumont, Stephen, A Taste for Beer. Toronto: Macmillan, 1995, p. 6. 76. Fort Garry Brewing Company Ltd. web site, “Company Profile - Tradition,” www.fortgarry.com/profile/profile_part2.html, viewed 7 May 2002. 77. Trayner, The Beer Drinker’s Handbook. 78. Initially, the B.C. licenses did not allow beer to be brewed on the same premises as it was consumed (Beaumont, Stephen Beaumont’s Great Canadian Beer Guide). 79. Beaumont, Stephen Beaumont’s Great Canadian Beer Guide. Indeed, during the “decline of distinction” many superior, though less popular beers, disappeared, and, according to Beaumont, it took Fritz Maytag and the Anchor Brewery in San Francisco to demonstrate that specialty beers could compete for a niche market against the mainstream lagers. 80. Brewers Association of Canada, “Success by any Other Name: Lakeport Pours on the Growth,” Way Beyond Beer, 2001, vol. 3, p. 9. 81. Flack, Wes, “American Microbreweries and Neolocalism: ‘Ale-ing’ for a Sense of Place,” Journal of Cultural Geography, 1997, vol. 16, no. 2, pp. 37-53. 82. Brewers Association of Canada, “Main Street Revival: Beer and the Renaissance of Creemore, Ontario.” Way Beyond Beer, 2001, vol. 3, p. 6. 83. Brewers Association of Canada, “Growing Better Barley.” Way Beyond Beer, 2000, vol. 2, p. 16. 84. Brewers Association of Canada, “Tapping Foreign Markets.” Way Beyond Beer, 2000, vol. 2, p. 9. The editors wish to thank Dave Craig for making his impressive collection of breweriana and extensive knowledge of Manitoba’s early brewing history available for this article. Cheers, Dave!